Three months of working at the Albert Schweitzer Hospital in Africa. Three months of contemplating the legacy of the fabled French humanist. Three months of pondering his own future in medicine: A DMS student reflects on his time in the shadow of the late great medical missionary. The Veterans Affairs medical system has long been doing battle against the special health problems of veterans. And, of late, the VA has been engaged in fiscal battle. Here are some insights into the patient population the VA serves and into how Dartmouth benefits from its affiliation with the White River Junction VA.
What a difference a century makes! First look back at some of the medical and technological advances that have occurred since 1900, then marvel at some prognostications about the state of medicine in 2100. The wonders and mysteries of the world of microbes are explored in a new book coauthored by the former chair of biochemistry at DMS. Here are some excerpts from the just-published work. From completing the Ironman Triathlon to helping rebuild Kosovo's only medical school, Dartmouth medical students and faculty have been tackling some tough challenges. The admissions cycle: Will it be yes? Or no? Or an agonizing maybe? By Dean J. Seibert, M.D. 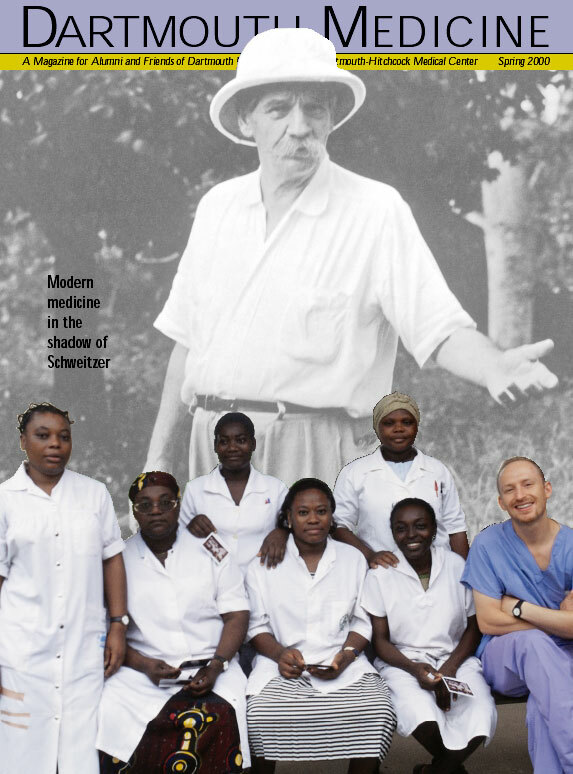 "Peter Kwiterovich '64: Battling cholesterol"
"Barry Smith: A collaborative approach"
DMS student Will Anninger is pictured here with the nursing staff on the internal medicine service at the Albert Schweitzer Hospital in Gabon. The background photo of Schweitzer is courtesy of the Schweitzer Fellowship. Anninger's account starts on page 22.